Every Christian has a testimony, a story of a time when God’s power broke through bringing healing, strength, transformation, provision, answers, salvation, or hope. Yet many of us have a hard time telling that story. It’s amazing how holding a small prompt, like a picture or an object, can open the door to sharing. One of my favorite ice-breakers is to spread picture cards on a table. 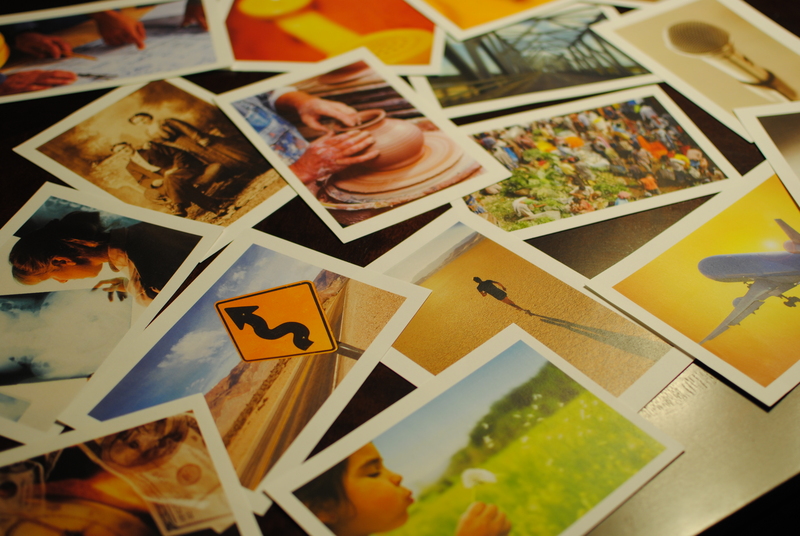 (I used a wide variety of stock images from Microsoft Office to make the cards.) Persons are invited to look at the cards and pick one to use as a jumping off point for a story about themselves. It’s remarkable how often the sharing become very deep very quickly. This idea is based on an excellent product called Visual Explorer from the Center for Creative Leadership. Their product is far superior to my homemade cards and comes with a facilitator guide which outlines multiple uses for the cards. My friend Robyn Pence made a set of stones for a recent healing service. She approached their preparation with great amounts of prayer. 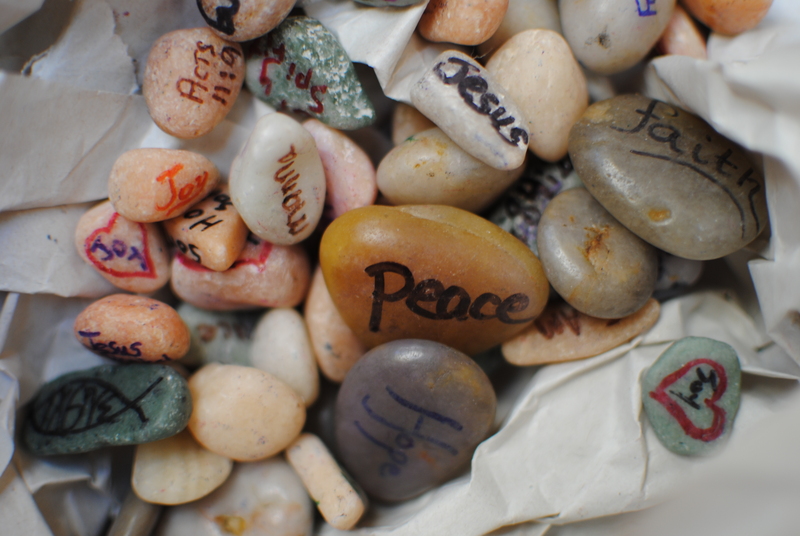 Each stone was different- some had a word or phrase, some a drawing or symbol, and some had a scripture reference. Persons were invited to take a stone in remembrance of God’s promises and grace. We were surprised how many people lingered following the service to share what we later called stone stories- stories brought to mind because of what they found on the stone. In Luke 24, we find the travelers on the Road to Emmaus. They are discouraged, frightened and confused. They thought Jesus was the Messiah, but now he is dead. A stranger joins them and they pour out their hearts to him. He in turn fills their hearts with the truth of scripture and fills their mouths with the bread of heaven. Holy Communion becomes a meal of hope and healing. This altar table display was created for a healing service based on Luke 24 which offered both Holy Communion and prayer with anointing and laying on of hands. The ascending candles draw together the communion elements (bread and cup), the two small bowls containing the anointing oil, and the flowers representing growth and new life. Two things have become very important to me. Good liturgy operates as something of a wedge that opens space between our status quo and world that God desires. We become aware of the space between what is and what is yet to be. Likewise, the liturgical act is the peeling away of the layers of apathy, egotism, and ultra-pasteurized homogeneity to reveal and revel in something meaningful, communal, and sublimely diverse. It is this space between, the creative moment, the liminality of the threshold between that pulls us closer to God’s heart. The second is tied to the first. All types of people can and should lead worship- children, teens, seasoned citizens, men, women, handi-capable persons, rich and poor, educated and under-educated …. If a community of faith values being the Body of Christ- diverse, gifted and intergenerational- than they should model and practice that value in worship. The Parable of the Soils, also known as the Parable of the Sower (Matthew 13), is simple yet profound- a farmer casting seed generously without regard to where it will land, the seed responding in various ways. 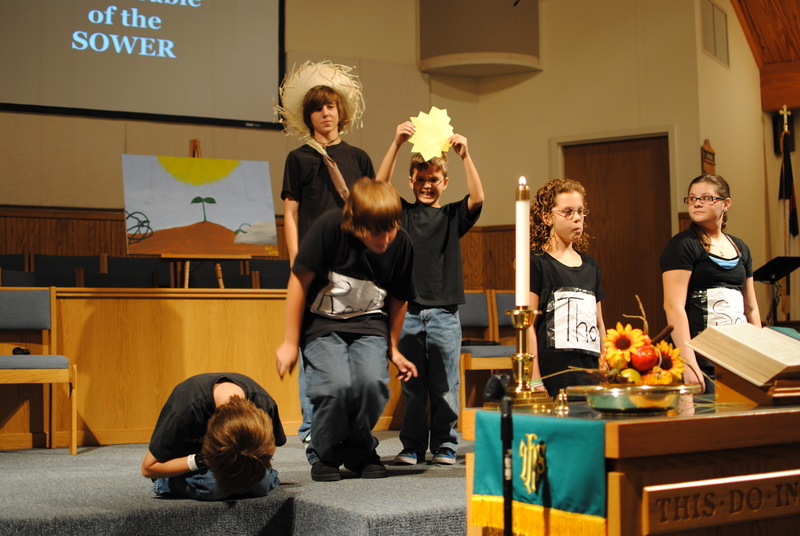 This parable lends itself naturally to mime and is especially delightful when enacted by children. In this reader’s theater version, the Narrator remains an offstage voice. The surprise is the smallest/youngest cast member has the largest part. Click here for a wonderful, honest reflection on Jesus’ Matthew 13 Kingdom of God Parables by Rachel Held Evans entitled Slow. Click here for a moving reflection by Steve Garnaas Holmes entitled Sower. [The women at the tomb] hear a welcome in the greeting and fall to their knees before the resurrected Jesus. 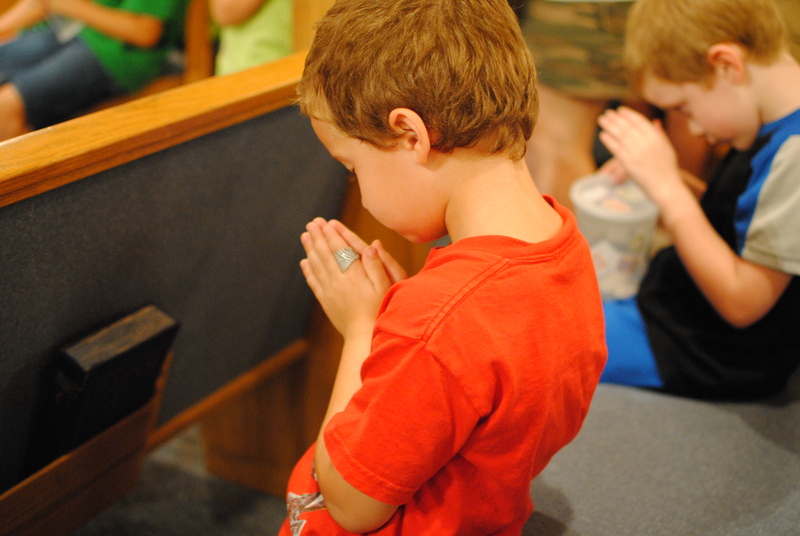 Their first response to the risen Christ was to kneel in awed reverence. There was also an element of intimacy in that reverence, for they dared to touch and hold on to His feet: they ‘worshipped Him’ (Matthew 28:9)… The two elements together became worship. Falling to our knees before Jesus – an act of reverence – is not in itself resurrection worship. Touching and holding the feet of Jesus – an act of intimacy – is not in itself resurrection worship. The acts of reverence and intimacy need each other. The reverence needs the infusion of intimacy lest if become a cool and detached aesthetic. The intimacy needs to be suffused in reverence lest it become a gushy emotion. These women knew what they were doing: they were dealing with God in the living presence of Jesus, and so they worshipped. To be boring is to bear false witness. – one of Tom Driver’s “ten maxims for ritual” in his book, Liberating Rites: Understanding the Transformative Power of Ritual. then I don’t think we are fully joining into the story. But the hour is coming, and is now here, when the true worshipers will worship the Father in spirit and truth, for the Father seeks such as these to worship him. Looking for a profound way to illustrate Jesus’ words, “This is my body, broken for you”? Try Bread Man. This simple version of Bread Man is made of 1 large round loaf (head), dinner rolls (body), 2 long loaves (legs), and 2 shorter loaves (arms). The dinner rolls in the upper right corner are removed and replaced with a clear, heart shaped container filled with wine or grape juice. 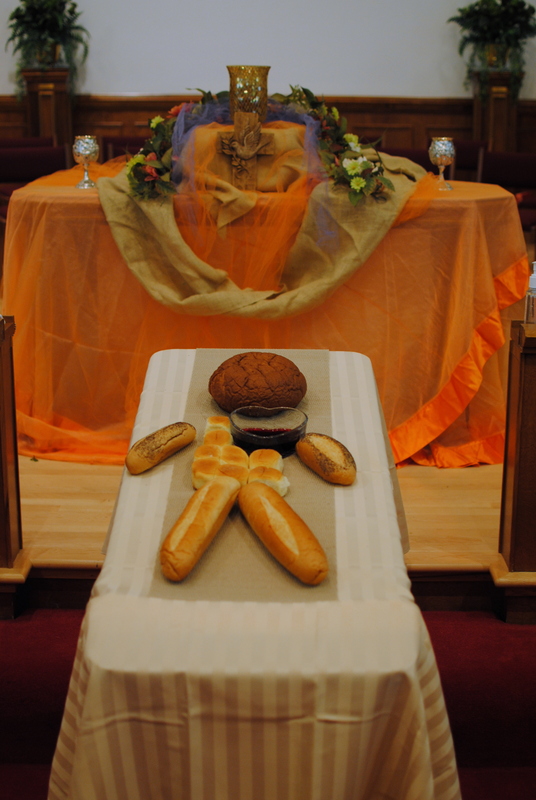 Build Bread Man piece by piece during an opening processional or by having persons rise from different places within the congregation to bring their portion forward. If you have dancers, they could dance the pieces up to the altar table. Helpful Hint: Practice this with the breads still in their wrappers. Bring Bread Man in already assembled as part of a solemn, funeral style procession. Or, process the very broken Bread Man out in the same fashion. You might consider reading the burial of Jesus (Matthew 27:57-61; Mark 15:42-47; Luke 23:50-56, or John 19:38-42) or Psalm 22 at this time. When using Bread Man for Holy Communion, have the person officiating break Bread Man as part of the Great Thanksgiving. Pour the wine/juice from the heart into the communion chalice(s). The communion servers then use Bread Man to serve the congregation. For an even stronger visual, have each member of the congregation break off their own piece of Bread Man as they come forward for communion. They could dip the bread into the wine/juice heart of Bread Man themselves or move forward to receive the wine/juice from a communion server. Helpful Hint: If you are using this method, you may want to supply the congregation with hand sanitizer before they reach Bread Man. This display would be great for worship services emphasizing brokenness, the Body of Christ, Christ’s sacrifice, the cost of sin, the crucifixion, and Good Friday. 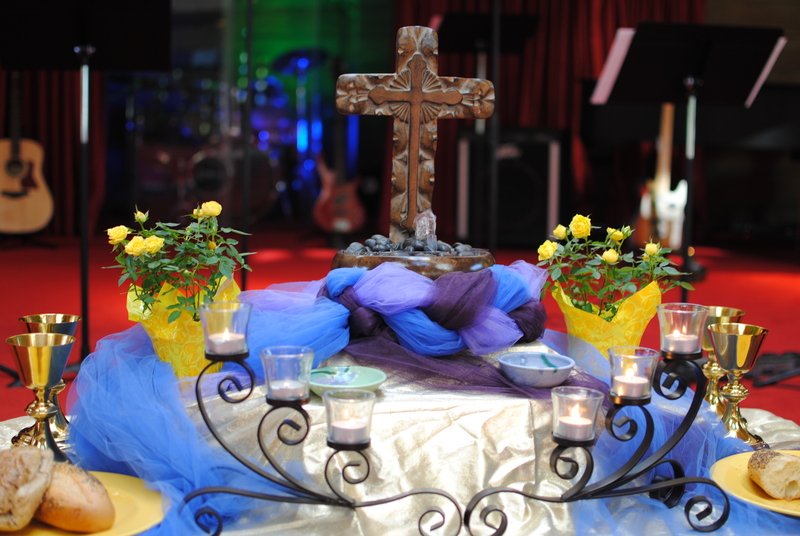 This altar table display is part of a series of displays designed by Robyn Pence and her team for the 2011 Summer Church Music Workshop sponsored by the Florida Chapter of the Fellowship of United Methodists in Music and Worship Arts. The workshop is a terrific yearly event which includes sessions for adults and youth in areas such as traditional choir, contemporary worship, liturgical dance, sign language, handbells, banner making, altar table displays, organ, guitar, etc. plus great worship and fellowship. 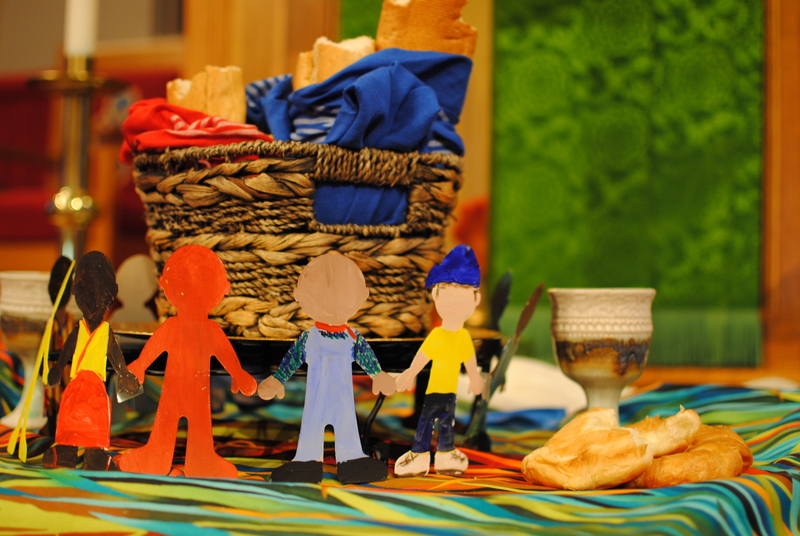 Who knew paper dolls could make such an effective altar table display when paired with brightly colored fabric and breads from around the world. This display would be great for worship services emphasizing peacemaking, unity, diversity, reconciliation, the Body of Christ, the Universal Church, missions, the Great Commission, or World Communion Sunday. Everyone is welcome at the table!